As emphasized in the previous sections, accessibility is among the city’s prime advantages. The city is provided with good access roads to and from adjacent cities and municipalities. Considered as the heart of Metropolitan Manila, main roads such as Epifanio de los Santos Avenue (EDSA), Ortigas Avenue and Shaw Boulevard provide inter-city linkages, while Boni Avenue and Martinez Street (C-3 Road) serve as alternate routes. A total of nine (9) concrete bridges (Table 6.01) connect gaps in the road network while several minor roads provide additional access from the San Juan Municipality. All in all, the city has 31 entry and exit points, as can be seen in Map 56. Also shown are network interchanges designed to facilitate crossing and access to EDSA, as well as existing and proposed rail transport lines traversing the city. At present, the city is served with a total of 119.813 km of roads (see Table 6.02) classified into four (4) types of administration: national, city, barangay and private roads. This gives a road density of 10.60 km for every 100 hectares of land, way above the standard ratio of 1 km/100 ha., making Mandaluyong actually over-served with roads. This, however, does not ensure efficiency of the road network, which is also affected by socio-economic factors, land use characteristics, and the environmental condition of the area it serves. the PNP Traffic Enforcement Division of the City Police. The TPMO employs traffic aides who direct traffic on congested streets and intersections. Towing and impounding of stalled vehicles are also carried out by the division to ensure that streets and thoroughfares are free from any obstruction that may result to congestion and bottlenecks. The PNP Traffic on the other hand takes care of major thoroughfares, responds to traffic emergencies and issues violation tickets to traffic violators. Being an inland city and generally flat but for a few gentle slopes, internal circulation is land-based utilizing different modes of transportation such as public utility jeepneys, tricycles and pedicabs, private cars and the rail transit system. Of these, the most popular is the jeepney, considering the income class of majority of the commuters and its economic advantage over the car in relatively short distances within and outside the city’s periphery. While jeepneys ply the main city roads, tricycles and pedicabs serve the interior roads both through zone routes and upon demand of passengers. 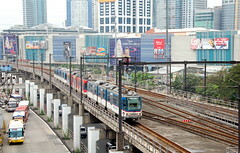 Commuters traveling the length of EDSA commonly use the Metro Rail Transit (MRT) as it considerably reduces travel time about ten-fold compared to the regular commuter bus. 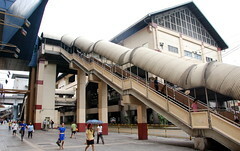 The MRT has three stations in the city: at Boni Avenue, Shaw Boulevard and Ortigas Center. However, the bus is still preferred by some due to its more direct access to both origin and destination in the vicinity of EDSA, as well as the fact that buses are available on a 24-hour basis. The rail transit operates only within a scheduled routine, which is from 5:30 a.m. until 10:30 p.m. daily. When traversing the city, North-South bound and East-West bound buses are confined along EDSA and Ortigas Avenue, respectively. Visual representations of the different routes are shown in Map 57. 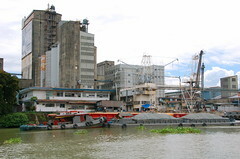 The presence of the Pasig River stretching along the south border of the city provides an alternative route and mode of transport mainly for cargo freight of industries along the river, and for commuters opting for a faster and more direct route to and from the cities of Pasig and Manila. Brgy. 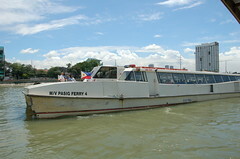 Hulo hosts one of 14 stations operated by the Pasig River Ferry Service. 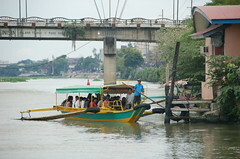 In addition, traditional wooden bancas still carry passengers across the river to and from Makati City. Map 58 shows the locations of water transport terminals and Tawirans in the city. The policy to encourage a more efficient use of land by allowing higher density activities has also attracted more clients and consumers who, in turn, require transportation, thus resulting in increased volume of vehicles and busier road network. Highly populated areas in some barangays of the city have also generated problem on insufficient parking. A lot of houses have no provision for parking, thereby utilizing the streets as parking during night time or even longer. Although the city has designated areas of tow-away zones, there is still the issue of not having enough home/private parking for residents. As of February 2001, 946 units of Public Utility Jeepneys have franchised operations listed by the LTFRB with more than 50% having expired franchises confirming unofficial reports of PUJ’s illegally operating in the city. These “colorum” jeepneys compete with those legally operating in picking up passengers, ignoring the designated loading/unloading zones resulting to obstruction of traffic flow and exposing passengers/commuters to the hazards of traffic accidents/ reckless driving. A frequent complaint is the lack of discipline among tricycle drivers plying the Bone Avenue – Producer’s Market and Boni Avenue – Crossing routes as manifested by over-speeding, swerving and sometimes racing with fellow tricycle drivers. In addition, road courtesy is almost absent among these drivers as can be observed in frequently-used road intersections. Furthermore, tricycles occasionally take major transport routes despite clear traffic prohibitions, endangering passengers while at the same time being a nuisance to other motorists. 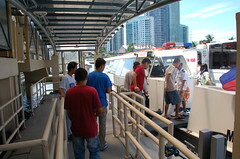 Jeepney drivers on the other hand, oftentimes behave like their colorum counterparts as earlier described.